For the serious miner interested in cuttable gems. This box is loaded with all the types of gems plus lots of rubies and sapphires. Over 5,500 carats of gems, including more than 1,500 carats of rubies and sapphires. You’ll find Rubies, Sapphires, Emeralds, Amethyst, Citrine, Kyanite, Moonstone, Aquamarine, Sodalite, Rose Quartz, Orange Calcite, Aventurine, Rainbow Fluorite, Smoky Topaz, Blue Quartz, Garnets, and more. 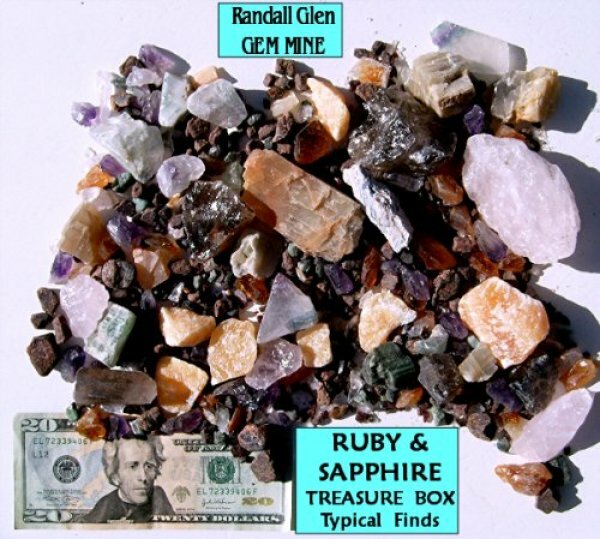 Your box includes Gem Dirt from our mountain, including stones large enough to cut for jewelry, a Gem Identification Card, a Genuine Ruby and Sapphire to help with identification, and full Instructions on mining your gems. Call us at 828-683-5758 to order.